Earlier, I stated how I wanted no piece of Joel Pineiro on the Mets. Well, somehow we have a pitcher I would want even less. But let’s start off talking about the good things Washburn brings to the table. He was having the best year of his career last year before a late-season trade to the Tigers. In his first 20 games of the season, Washburn had a 2.64 ERA and a 1.188 WHIP. He had 15 Quality Starts and his 2.39 K/BB ratio was the best of his career. Even though he struggled after the trade, Washburn had a strong year with a 3.68 ERA. Overall, Washburn has been fairly durable. He has appeared in 28 or more games in eight of his last nine seasons and made 25 starts in the other. While Washburn was enjoying a banner season with the Mariners, two red flags stand out. First, Washburn benefitted from an outstanding outfield defense in Seattle. With a 27.1 UZR/150, Franklin Gutierrez posted the third best fielding mark among outfielders in the majors. At 11.3, Ichiro Suzuki ranked 12th. The Mariners did not have a full-time LF due to injuries but four players logged 30 or more games in LF and each of them had double-digit UZR/150 rates, ranging from Ryan Langerhans (30 games, 16.9 UZR/150) to Endy Chavez (40 and 23.4). Contrast that to what Washburn would be pitching in front of with the Mets. Jason Bay had a -11.2 UZR/150 in LF, Carlos Beltran had a -8.5 in CF and Jeff Francoeur had a -5.9 in RF. Now, there are questions about each of these numbers. Bay played in Fenway Park, which is a notoriously difficult place to play LF. Beltran, normally a fine defensive outfielder, was hurt and playing his first year in his new park. Two years previously, Francoeur was a good defensive outfielder. It would not be a surprise to see all three Mets OFers post better defensive numbers this year. Still, there is no way they are going to be remotely as good as the Seattle OF. This is especially important to Washburn, who is a fly ball pitcher. Last year he had a GB/FB ratio of 0.88, which was the eighth-lowest mark in the majors. And while the Mariners defense was good, Washburn further cashed in last year while in Seattle by being lucky. While his ERA in Seattle was 2.64, his FIP was 3.80 and his xFIP, which normalizes his HR rate, had him at 4.50 for his time in the AL West. His BABIP was .249 (most pitchers fall in the .290-.310 range) and he stranded 75.4 percent of his baserunners (normal is around 70%). 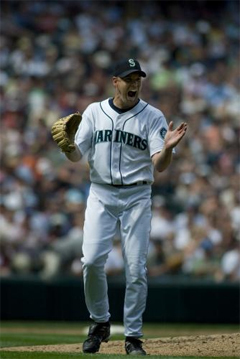 Finally, as xFIP showed, Washburn was very lucky with HR allowed in Seattle. He had a 6.4 percent HR/FB rate. Most SP have a HR/FB rate of 11-12 percent. And we saw how things changed once Washburn was traded. His ERA ballooned to 7.33, his BABIP rose to .280, his strand rate fell to 65.1 percent and his HR/FB rocketed to 18.5 percent. One could argue that he was as unlucky in his brief time in Detroit as he was lucky in his time in Seattle. But that only reinforces the point that he was lucky the first part of the season. Both FIP and xFIP look to remove luck from a pitcher’s ERA. Washburn finished the year with a 4.58 FIP and a 4.73 xFIP. And while Washburn has racked up a fair number of starts/games over the years, he has not necessarily given innings. Only twice in those nine seasons as he topped the 200-IP mark. He has averaged 182.2 IP over the past nine years, which is good, but hardly great. The Mets have a hole for their #2 SP. Ideally, their second-best pitcher would throw more innings than that. Washburn is a fly ball pitcher who depends on his outfield to help put up good numbers. With the Mets, he is unlikely to receive anything close to the level of defensive support that he received last year in Seattle. Also, he is unlikely to be as lucky as he was last year. Washburn could see a bump in his numbers moving from the AL to the NL with no longer having to face designated hitters. But his realistic upside seems to be league-average pitcher, while his likely performance is an ERA closer to his 4.58 FIP of a year ago. It makes no sense for the Mets to actively purse a 35-year-old pitcher who relies on his defense, especially if it is for a contract longer than one year at minimal dollars.